This is a very low-growing perennial with almost circular, short-stalked leaves attached to creeping stems which root as they creep over the ground. As the plant matures the foliage becomes orangey-brown. It arrived accidently from its native New Zealand with other plant material and was first noted in 1908. 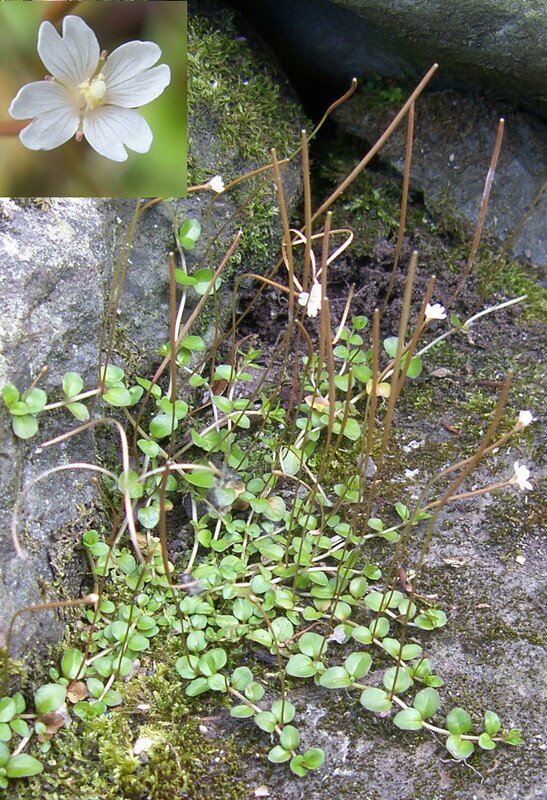 Found mainly on paths and in crevices in walls, it likes alpine conditions, so is widespread in mountainous areas of Northern Ireland and the rest of the British Isles. In fact it is thought to be the only alien plant to have colonised such places. The pinkish-white flowers are held aloft on long ovaries typical of the willowherbs. When the seed capsules mature they split open, curling backwards to release the seeds which are dispersed by the wind carried on a fluffy pappus (see centre left of picture). It is easily uprooted and should be removed before the seed capsules can mature. Dichlobenil prevents emergence of seedlings among established woody plants, for up to one year. Glyphosate, systemic action killing the whole plant, but does not deal with the seeds. A combination weedkiller for use on paths would be best. See also Broad-leaved Willowherb, Marsh Willowherb and Short-fruited Willowherb with similar flowers, but the growth habit and foliage are closer to Thyme-leaved Speedwell, Blinks or Scarlet Pimpernel. Follow these links for further details on Weeds, Weed Removal and Weed Prevention.